September, 14, 2018 - Messe Düsseldorf has reached the halfway point in one of the most ambitious construction projects in its history. On September, 14, the large construction site on the River Rhine witnessed the topping-out ceremony for the new Hall 1. 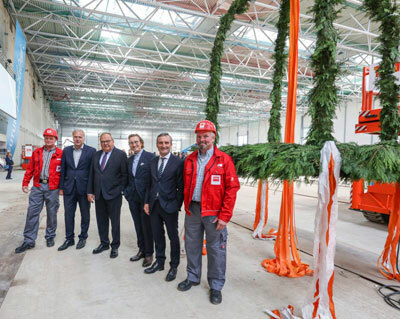 Comprising the new Hall 1 and the state-of-the-art South Entrance, this complex will strengthen Messe Düsseldorf as an international meeting point for industry and also as an economic factor for Düsseldorf as the capital of North Rhine Westphalia. The traditional topping-out speech was given by the construction managers, Thomas Schulte and Holger Meyer from Osnabrücker Köster GmbH, from the building site of the New Southern Section today, Friday, 14 September 2018. The audience included the Management of Messe Düsseldorf, the tradesmen, construction workers and exhibition centre staff involved in the construction project, as well as representatives of government and administration, the supervisory councils of Messe Düsseldorf and Düsseldorf Congress and the architects of the Düsseldorf architects slapa oberholz pszczulny | sop. The project, which will be completed by autumn 2019, includes the new multifunctional Hall 1 with meeting rooms, the glass-enclosed new South Entrance with a translucent illuminated canopy and an adjacent underground car park. Hall 1 will be 12,027 sqm in size, offering space for up to 10,000 people. In addition, the first floor will have six glass-enclosed meeting rooms, each with 200 sqm and space for 198 people. One of these rooms will protrude into the foyer of the new South Entrance, which will provide 2,112 sqm of event space. In front of it, 20 metres high and covering 7,800 sqm, there will be a canopy over a plaza with taxi ranks, public transport connections and an entrance to the new underground car park. This forecourt will also be suitable for events. “The building complex will increase the international attractiveness of Messe Düsseldorf even further and will strengthen its function as a meeting point for a wide range of industries,” says Werner M. Dornscheidt, President and CEO of Messe Düsseldorf. The New Southern Section forms part of the Messe Düsseldorf Masterplan 2030 with its many construction and redevelopment plans to ensure that the exhibition centre remains attractive and competitive. These include a number of completed projects, such as the new Halls 6, 7 and 8, the new North Entrance and the complete overhaul of seven halls. Werner M. Dornscheidt sees this as a crucial investment into the future: “In this way,” he says, “our premises will be further adjusted to suit demand and the needs of our customers, while also increasing the service factor.” In all, Messe Düsseldorf is investing 650 million euros in the implementation of its masterplan. The New Southern Section alone is costing 140 million euros. Moreover, Dornscheidt emphasises that they are “doing all this without subsidies”. It means that Messe Düsseldorf will be ideally prepared for the future. With a revenue of around EUR 367m in 2017, the Messe Düsseldorf Group maintained its position as one of Germany's most successful trade fair companies. Over 29,000 exhibitors presented their products to 1.34 million trade visitors at events in Düsseldorf this year. In addition, a range of conventions attracted over half a million visitors. About 50 trade fairs were held in Düsseldorf, including 23 number one events in five areas of expertise: machinery, plants and equipment, trade and services, medicine and healthcare, lifestyle and beauty, and also leisure. In addition, there were about 70 proprietary, joint and contracted events outside Germany. Messe Düsseldorf GmbH is the trade fair company with the highest level of internationalism in capital goods exhibitions. In 2017 Messe Düsseldorf's proprietary events in machinery, plants and equipment had approx. 74 per cent international exhibitors and attracted 73 per cent trade visitors from other countries. In all, Düsseldorf trade fairs were attended by customers from about 180 countries. The Group runs a global network of sales offices in 140 countries (with 76 international representations) as well as competence centres in 8 countries.